Like the brand’s initial FB 1 model, the new FB 1R-6 (US$241,500) combines a tourbillon with chain and fusee in a movement built with pillars made to resemble the watchmaking of the original French-Swiss virtuoso Ferdinand Berthoud in the mid-18th century. The addition of the regulator—known for its high precision and marked by non-coaxial hour and minute hands, with the minute hand always larger than the hour hand and placed at the center of the dial— necessitated some important changes to the caliber. Much of the display naturally sits on the front side of the movement, but what appears to be a brushed steel dial is actually the regulator bridge, a component of the movement. Minutes are built into the space for the time display in the original model, which has now been opened. Hours are displayed using a sapphire disk at 2 o’clock. 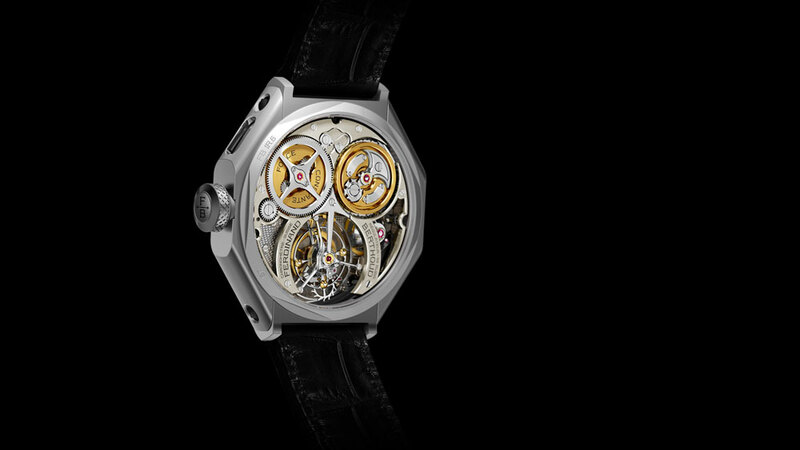 For the sake of design balance, the power reserve indicator was moved up slightly, a modification that required a complex lever system as well as a spiral spring to maintain tension. On the reverse, the brand has added a new finishing pattern to the lower plates and bridges. The repeating pyramid pattern is all engraved by hand and represents a demanding and risky level of work, as each indentation must be made exactly the same as others.